Neil Armstrong and Buzz Aldrin could not have been more different. As they rose through NASA, Armstrong proved a quiet hero, a closely guarded man of few words and even fewer outward emotions. Aldrin, who flew with Armstrong on Apollo 11 and followed him on to the moon, was brazenly outspoken, opinionated, and loud. The contrast is clear in director Damien Chazelle's First Man, a biopic about Armstrong (played by Ryan Gosling) that uses Aldrin (Corey Stoll) in part to emphasize the taciturn astronaut's reserve. 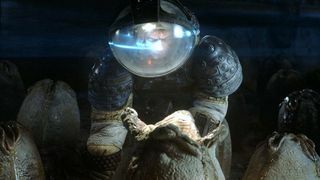 The character of Aldrin only plays a small role in the film, for which the real Buzz served as an informal consultant. As if to remind audiences that the portrayal of him on screen is accurate, Aldrin publicly, if subtly, criticized the movie during the bizarre, manufactured "controversy" about the use of the American flag in the climactic scene. Had the movie been able to run longer, perhaps he would have been mollified by a few additional Buzz Aldrin scenes that were ultimately cut for time. "We saw Buzz as a hero, he was super-sharp," screenwriter Josh Singer tells SYFY WIRE. "One of the things Buzz felt indebted to Neil for, and we had this in the movie but had to cut it for time, was that Deke Slayton gave Neil the option to have [Jim] Lovell on his crew instead of Buzz. Lovell was gonna be back in time from Apollo 8. Deke said, 'Buzz is the guy who's rotation is up, but if you'd prefer, take Lovell.'" Armstrong asked for 24 hours to think about it, and he would have been forgiven if he had opted to give Buzz the boot, given his personality clashes with the rest of the Apollo team. As Singer puts it, "I think it's fair to say that Buzz was not well-liked," and on a mission as risky as this one, with men in such tight quarters for so long, getting along and keeping the peace was obviously going to be crucial. As history shows, Armstrong ultimately decided to stick with his original crewmate. "Buzz is always grateful that Neil said 'no, I'm gonna take Buzz,'" Singer said. "I think it was in part because Buzz was super bright, and super good at his job, even if he had no filter, and might have had some interpersonal issues as a result. And also, Lovell was up for his own command." Aldrin wound up playing a crucial role on a rocky trip, maintaining his composure as the lunar module exhausted the last of its fuel and began wheezing toward a crash-landing. That close call made the final version of the film, but one that took place after they made their moonwalk got left on the cutting room floor. "The ascent engine on breaker broke off, which Buzz discovered right after they were EVA on the moon, and if they can't fix that breaker, they can't get off the moon," Singer explained. "So they actually had to call mission control, and mission control said, 'We don't quite know, get some sleep, and we'll tell you after your sleep period.' Which is crazy, the fact that they actually slept for five hours knowing they might not be able to get off the moon. It's nuts. And then ultimately, Buzz figured out, he had a felt tip pen that he sort of jammed into the breaker that got the switch to the breaker on, which was how they armed the ascent engine." The actual moonwalk provides a culmination and a release, and so the scene was cut for both run-time concerns and story flow. It denies Aldrin a hero moment, adding to the concern the filmmakers felt about how the real Buzz Aldrin might react to the movie. And again, though Aldrin was very quietly critical of that American flag "controversy," Singer reports that Aldrin was all-around pleased with the movie. Buzz has seen the film, and liked it, which was quite heartening. We tried to be quite careful with Buzz, and I was very nervous about Buzz seeing the film, but Robert Pearlman said, 'Are you kidding? There have been much worse portrayals of Buzz.'" First Man is now in theaters.